The post-colonial political landscape of many African countries has been characterized by instability, government ineffectiveness, as well as inequality among regions. It is namely because of the latter two, that many governments have lacked legitimacy, thus giving rise to discontented groups and movements, having more often than not, equally violent counter-responses to government repression. In this respect, the Democratic Republic of Congo( DR Congo) has been a representative case for the institutional failure and the violence surrounding many of the states in this region. After many years of military rule, tensions and coups d’etat, the year 2014 brings the challenge to the DR Congo of stabilizing its political regime. This has been, in fact, an ongoing issue, as the post-colonial background of DR Congo has been constructed around notions of instability and corruption, starting with the aftermath of its independence in June 1960. In order to better understand such strong criticism, a brief historical understanding of the evolution of the country in political terms is required. The 1960 elections placed Joseph Kasavubu in the presidential seat of the DR Congo, and Patrice Lumumba as prime minister. Five days later, because of low pay and the absence of any promotion opportunities, elements of the army mutinied. This was followed by a successful attempt at secession by the mineral- rich province of Katanga under Moise Tshombe in July. The uprise of the military proved victorious in its initial demands, and many master-sergeants were rapidly made colonels. More importantly, however, it was the time in which Joseph-Désiré Mobutu started to become important as a future political figure, after being appointed chief of staff. In the context of the secessionist tendencies of Katanga and Kasai(the second- richest province), Prime Minister Lumumba turned to the USSR for assistance, which was granted through the advancement of weaponry. Following the logic of the Cold War, the Soviet presence was not well seen by the United States, which was now looking for a way to replace Lumumba. Such a move was favored by the recent clashes between him and president Kasavubu, who engaged in an alliance with the U.S.. Consequently, in September 1960, with the support of the CIA, Joseph Mobutu arrested Lumumba, thus overthrowing the government. Four years later, the same Mobutu took advantage of the Simba Rebellion against the abuses committed by the Congolese government and seized control of the country in 1965, proclaiming himself president for five years. However, by 1970, he had already managed to consolidate his power and to be elected. Renaming the country Zaire and himself Mobutu Sese Seko, he established what can be called a “personal-coercive regime”, with a clear foreign policy against Soviet- backed Angola. Zaire under Mobutu became a framework for constant abuse of public institutions and brutal oppression against discontented civilians, with the help of the military and the coercive apparatus. In spite of a quasi-democratic façade given by the existence of a kind of opposition – particularly Union pour la Démocratie et le Progrès Social-Zaire remained a highly repressive political regime. The internal situation witnessed a change after the end of the Cold War, when the country ceased to be of interest to the United States. No U.S. presence was, therefore, seen during the late 1990’s, when Zaire faced difficult spill-over effects of the events in neighboring Rwanda, which would become an ongoing problem even in the late 2000’s. The arrival of extremist Hutu militias on the territory of Zaire gave a boost to the already existent anti-Mobutu rebels, who successfully captured the capital, Kinshasa, forcing him to flee the country (a struggle for power commonly known as the First Congo War, between 1996 and 1997). Subsequently, Laurent-Desire Kabila was named president and the country was renamed DR Congo. Nevertheless, the turmoil continued, as Kabila himself proved to have little ability in managing the problems faced by the country. A rift soon occurred between him and his formal allies, triggering the rise of a new rebellion- Movement for the Liberation of Congo- led by Jean- Pierre Bemba and backed by Rwanda and Angola. Kabila was supported by Namibia and Zimbabwe in what is known as the Second Congo War (1998-2003), longer and far more damaging than the previous. Laurent Kabila himself was killed in January 2001, leaving the presidential office to be occupied by his 31-year old son, Joseph. By June 2003, all foreign troops had left out of Congo, with the exception of those of Rwanda, and a transitional government was formed. 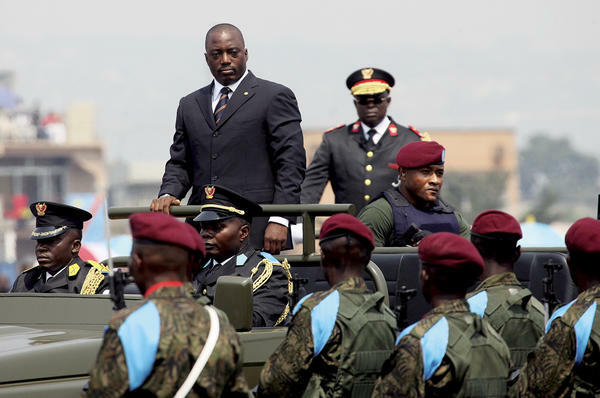 Three years later, a new constitution was ratified, and in July 2006, the country faced its first free and fair elections, with Joseph Kabila overcoming his opponent, Jean-Pierre Bemba, and winning 45% of the votes. The results stirred armed clashes in Kinshasa due to complaints of fraud, and elections were renewed in October, with results still in favor of Kabila. The transitional government officially ended in December that year and he was then sworn in as President of the Republic. In spite of the indicators of potential stability at that time, conflict was renewed in the eastern part of the country in 2008, when Rwandan Hutu rebel militias clashed with government forces in April. In an attempt to put an end to the unrest, troops from Rwanda were invited by the government in January 2009 in a joint operation against these militias. Still, the violence and human rights abuse in the east revealed once again that DR Congo was still a weak state, with prospects of increasing instability. In this respect, Kabila’s re-election in December 2011 triggered violent protests in the capital by those who supported candidate Étienne Tshisekedi. Nonetheless, the former was sworn in for a second presidential term. As for the eastern region, it continues to face unrest, particularly in the North and South Kivu, where the Democratic Forces for the Liberation of Rwanda posed a threat to the Rwandan border. In April 2012, the east saw the formation of a new rebel group known as the March 23 Movement (M23), consisting namely of former members of the National Congress for the Defence of the People, a political armed militia established in 2006 in the Kivu region. The offensive began in July, when the rebels taking over Buganda, a city located at the border of the DR Congo with Uganda. By November that same year, the Movement managed to capture Goma, the provincial capital of North Kivu. However, its activity officially ended in November 2013, when M23 was defeated by the Congolese government, with the help of an United Nations intervention via MONUSCO. This was followed by a peace agreement in December. In spite of the successful offensive by the Congolese government and its victory over M23, the Democratic Republic of Congo continues to remain a delicate and unstable political entity. From a strong, but highly repressive Zaire under Mobutu Sese Seko to the recent phenomena and templates, the country has been weakened to a point where it is currently in a stage of late regime breakdown, although significant improvements have been made beginning with the defeat of M23 in 2013. Still, this is hardly enough to fulfill a permanent stabilization of the country, and even to pacify the entire eastern region. The case of Congo-Kinshasa is a particular one in political terms, because it is more difficult than in other cases to speak of specific regime characteristics, let alone the functions of institutions. The institutional disappointment and the absence of a coherent and recognizable political elite should not discourage one to acknowledge the recent progress as being significant though. As always, caution is the way to go, but even more in the case of the DR Congo, where there is much less room for predictions, and where the scenarios are more diverse and the situation is versatile.